We will be using tblEmployee table for this demo. 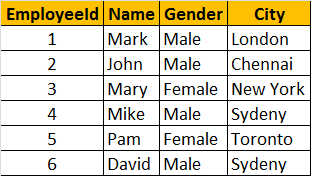 For SQL script to create and populate this table, please refer to, Part 13 - Deleting data from gridview using sqldatasource control of asp.net gridview tutorial. 5. Configure objectdatasource and gridview control. 6. Set "EmployeeId" as the value for DataKeyNames property of the gridview control. Step 5: Configure objectdatasource and gridview control. Compile the project. If the project is not compiled, EmployeeDataAccessLayer class may not show up in the wizard when configuring objectdatasource control. 1. Right click on "ObjectDataSource1" control and select "Show Smart Tag"
Now, associate "ObjectDataSource1" with "GridView1"
Step 6: Set "EmployeeId" as the value for DataKeyNames property of the gridview control. This can be done in HTML or code. Since, EmployeeId is the primary key, we need to set it as the value for "DataKeyNames" property of the gridview control, otherwise deleting does not work. ObjectDataSource 'ObjectDataSource1' could not find a non-generic method 'DeleteEmployee' that has parameters: EmployeeId, pEmpid. Exception Details: System.InvalidOperationException: ObjectDataSource 'ObjectDataSource1' could not find a non-generic method 'DeleteEmployee' that has parameters: EmployeeId, pEmpid. I also got same error: Server Error in '/' Application. I tried to do the following but it did not work either.